Robert and Stacy Denoncourt dreamed of building a new barn on their recently purchased York County, PA property. But they didn’t want just any barn. They dreamed of a well-built structure with character and style—one that would add major curb appeal to their hilltop property and coordinate with the look of their existing home. The couple spent several frustrating months trying to find a quality barn builder. In some cases, a contractor would go weeks before replying to a quote request; in other cases, the couple wouldn’t receive a reply at all. Finally, the Denoncourts contacted Quarry View Construction. Our team responded in about a day. We immediately started a conversation about what the couple envisioned and how Quarry View could make it a reality. We started working from an original concept plan that Robert, who has an engineering background, had already created. Within 48 hours of receiving his plan, we had sent them our initial rendering. Planning continued even while the couple vacationed out of the country. Our design team collaborated with them remotely via screen sharing and web conferencing software. Robert and Stacy provided us with feedback, and we made changes as they watched on their computer. 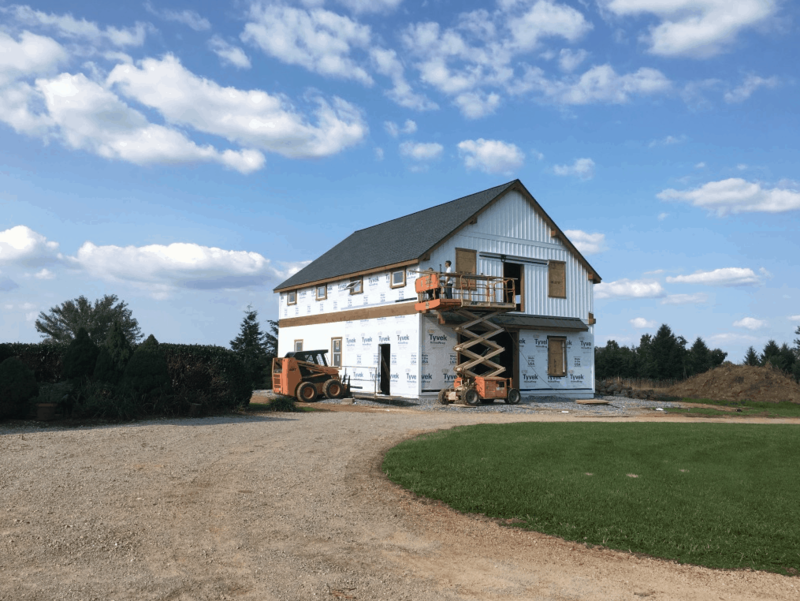 Our team made extensive use of technology throughout the project, including the use of drone footage to determine the best position for the new barn on the property. Throughout the process, we kept the Denoncourts’ best interests at heart. For example, when one specific portion of the project was completed under budget, we notified them. This allowed the couple to use the leftover dollars to upgrade their siding choice to a higher quality, insulated option. “Their project management and customer service are top notch. We had daily communication throughout the project,” says Robert, who would often visit the crew onsite after his work day was done. After about two months of construction, the Denoncourts’ barn was completed. It features two levels, each with 1,400 square feet of space, as well as two mortise and tenon timber lean-tos. Robert admits that, with his background in woodworking and engineering, he had high expectations for the barn construction team—standards, he says, the crew exceeded. “They could have cut corners, but they didn’t,” Robert says. Our team loved working with the Denoncourts, and we’ve continued to help them with post-project needs. For example, when the couple wanted to add timber features on their home to match what we’d used on the barn, we put them in touch with our supplier, so they could purchase it directly and finish their home project. Get in touch with us to learn how we’ll turn your dreams of a new barn, garage, or other structure into a reality.